The Russians have developed the ultimate in sophisticated warplanes. Called the MIG 31, it can fly at six times the speed of sound, cannot be detected by radar, and possesses a weapon system ingeniously operated by the pilot's thought waves. It's an unprecedented achievement and American intelligence would like to lay their hands on it. 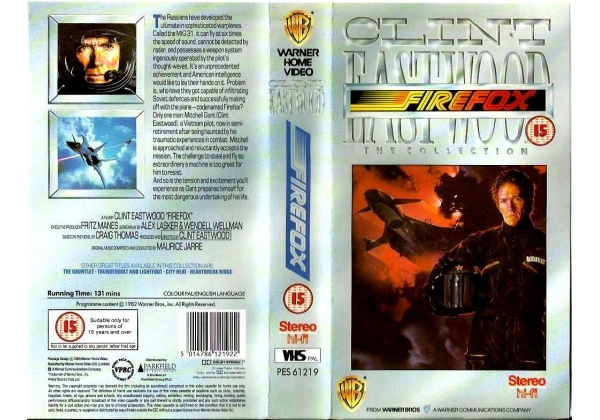 Problem is, who have they got capable of infiltrating Soviet defences and successfully making off with the plane-codenamed Firefox? Only one man: Mitchell Grant (Clint Eastwood), a Veitnam pilot, now in semi-retirement after being haunted by his traumatic experiences in combat. Mitchell is approached and reluctantly accepts the mission. The challenge to steal and fly so extraordinary a machine is too great for him to resist. And so is the tension and excitement you'll experience as Grant prepares himself for the most dangerous undertaking of his life. Or find "Firefox" on VHS and DVD / BluRay at Amazon.